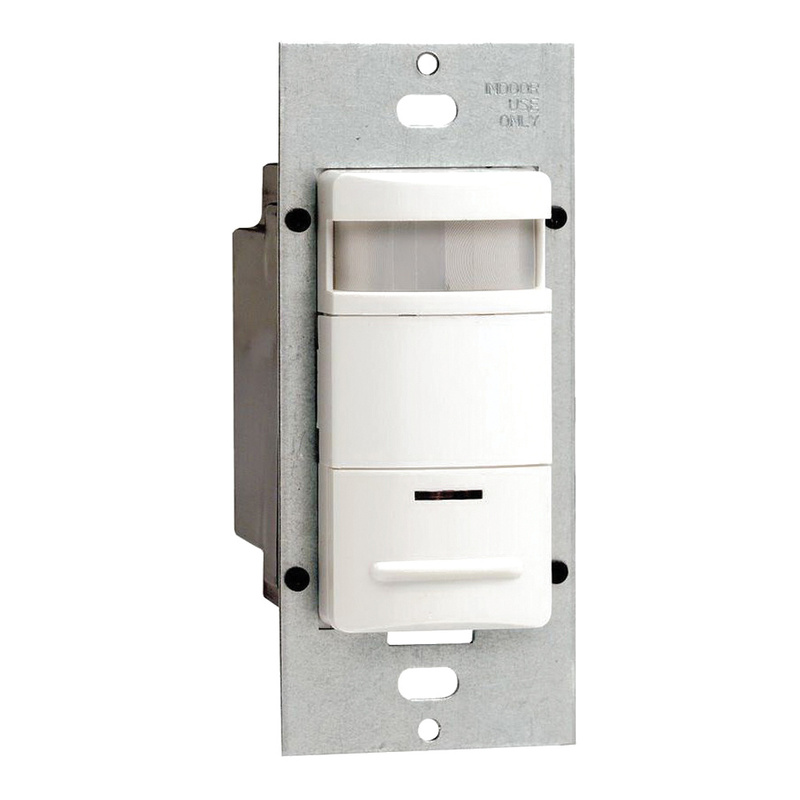 Leviton Decora® Vandal-resistant PIR occupancy sensor in light almond color, is operated at a distance of 2100-Sq-ft with 180-Degree viewing angle. The 1-Pole sensor uses segmented Fresnel lens for optimum sensitivity and performance. It has a maximum load capacity of 1800 VA at 120-Volts, 4000 VA at 277-Volts for fluorescent lamps and 1800-Watts at 120-Volts for incandescent lamps and 1/4 hp at 120-Volts for motors. This self-adaptive sensor has a voltage rating of 120/230/277-Volts AC. It has an additional manual service switch for the installer to force lights to hold-OFF or hold-ON during installation. The presentation mode feature for slide or film presentations permits the pushbuttons to turn lights OFF and keep them OFF while the room is engaged. When the timeout expires and the relays turn OFF, a 30-second vacancy confirmation activates to turn the relays back ON. The exclusive walk-through feature saves energy by not leaving the lights ON for an extended period after momentary occupancy. The self-adjusting delayed-OFF time interval compensates for real-time occupancy patterns, avoiding the unnecessary ON/OFF switching. The light sensor enables the load hold-OFF feature after level setting. Light sensor adjustable ambient light override ranges from approximately 2Fc (20LUX) to 500+FC (5000+LUX) to avoid lights from turning ON automatically during periods of ample natural light. The red LED indicator light flashes when PIR sensor detects motion to verify whether the detection is active. The horizontal field-of-view may be adjusted between 180-Degrees and 60-Degrees of arc using the integral blinders located on either side of the lens. The sensor meets UL, CSA, NOM, complies with California Title 24 energy code and FCC standards.